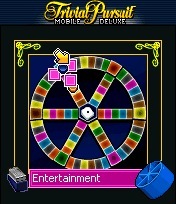 Justin: Trivial Pursuit Mobile Deluxe impressed me for a handful of reasons. The first thing I noticed was how many different modes of play there were besides just the classic "collect all the wedges" scenario. Jamie: I agree. I also appreciated that you could set it so the questions were multiple choice, or normal, open-ended Trivial Pursuit questions. Sometimes questions were worded in a way that was confusing and didn't make a ton of sense, though. Justin: What mode did you like most besides main board game? Jamie: Wedge Challenge was cool. 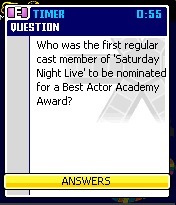 You're given ten minutes to get a question right in each category, along with one final random question. I liked pressure of being timed. Justin: I thought that was cool too. I also thought High Stakes was kind of neat. You bet points in advance on whether you'll get a question right or wrong, and then have to try and build up your bankroll. It's neat to compare your high score against other people in the leaderboards. Jamie: It was neat that the leaderboards tracked national high scores, and scores in your region, by putting in your area code. Being able to play against other people on the network was a big plus too, but if you were playing with more than two people it would take forever to get through an entire game, it seems like. Trivial Pursuit is pretty slow-paced, even when you play the real board game. It's even slower paced playing people online. Justin: With all the leaderboards and online functions it was weird that there didn't seem to be any way to download new questions. Once you start getting repeat questions the game would be pretty useless. Jamie: Yeah but we played a long time and never once had a question repeat. Plus, these are hard questions. It seems like there are hundreds included, so the odds are you wouldn't remember the answer anyway if it came back up. Justin: So what did you like most? Jamie: I really liked that you could play multiplayer with just one phone. There's been a lot of times that we've had some downtime or been waiting somewhere, and it's not like I just keep a box of Trivial Pursuit questions in my purse all the time. It's great to just be able to load it up and ask each other some questions. Justin: Yeah. What I appreciated most was that Starwave added modes of play that don't take long to complete, like the Question of the Day, or 10-minute Wedge Challenge. I also liked that you could save your game, play a different mode for a while, and then come back. Is there anything else you would change? Final thoughts? Jamie: It wasn't a huge deal, but the view of the board was a little too zoomed out, and it was hard to tell what was what. Sometimes I couldn't even tell if I was on a wedge square, or not. Also I wish you could skip the dice rolling animation. But overall, it's freakin sweet. The portability of it is great, and Trivial Pursuit is more than just a mindless time-killer - it actually engages you. What's Hot: Many modes of play, including online. Lots of questions. What's Not: View of board is too small.